I’m gonna blame it on our Korean teenage babysitter, Mike. He made a banana talk. The banana pleaded clearly in a high pitched voice, “Please eat me,”, making it abundantly clear that it would never emotionally recover from the rejection of being left to sit on the counter and turn to mush. It was all over after that. From then on, I was the seven year-old having conversations with my stuffed animals, gently explaining to them why I chose to sleep with the dog and cat at night and not the rest of them. I simply couldn’t bear to have them sitting on the floor, pining for my presence, resenting the stuffed feline and her canine pal, without a proper explanation of my decision-making process. It was a burden, this moral obligation to assuage the feelings of inanimate objects. Movies like The Brave Little Toaster sure didn’t help. The toaster got left behind! And he was sad cause he missed his family. Oh, the agony. My little heart could hardly bear it. Fast forward twenty some years. Last week our appliances staged a mutiny and crapped out all at once. No really, the fridge, the washing machine, and the dryer (temporarily), all kicked the bucket. Needless to say, it’s been a little ghetto-fabulous around our house, food stashed in a cooler (still) and laundry heaping up because the laundromat feels too far away, and I don’t think I’ve actually ever used one before. And I’ll be darned if I’m going to don a corset and petticoat and wash those things by hand. And so the laundry heap grows. But I digress. 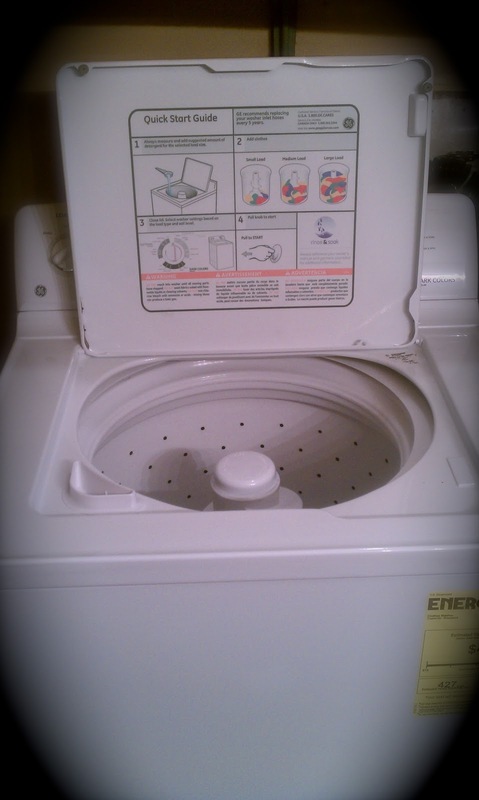 Today our washing machine was (finally!) replaced. Josh sent me a picture of the big white box that took up residence in our bathroom/utility closet. just see it now, shivering out in the cold and rain, it’s brownish exterior turning to rust, longing for the days when it was nestled snugly in our upstairs closet. Darn you, Mike, and your talking banana. How am I going to sleep tonight? I can only hope the purring of our new washing machine will lull me to sleep. aww :(there, there. i'm sure it'll understand. i mean, it did up and die on you first. Oh my gosh I do the same thing and Mike thinks it's hilarious. Most recently it was when we sold my car to carmax in South Carolina. They didn't give me a chance to say good bye. We even drove around the parking lot looking for it but no luck. Hilarious.